Most estate agents have great cameras these days, and will tell you they can get just as good shots as a pro photographer. After all, cameras have come on in huge leaps and bounds, and yesterday’s pro camera costing thousands is today’s amateur camera, costing less than a couple of hundred. 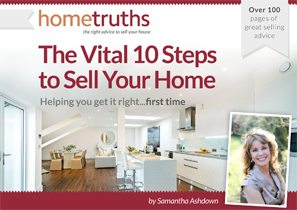 Meanwhile, Sam (me) tells you that you must have professional images to sell your house effectively and that an amateur’s efforts just won’t cut it. 1. A pro will see what an amateur won’t. When he has a tripod set up, he can evaluate the shot in a considered way, and move out of the way anything that might sabotage it: a cat bowl, a rubbish bin, even a colourful hairbrush. Anything that may distract a viewer from looking at the main features of a room. 2. A pro can deal with light levels. How often do you look at a photograph of a house interior on Rightmove, where the windows are just white boxes? This is what a pro calls ‘blown out’ and it is because an amateur doesn’t have the expertise to cope with dark corners and light streaming through the window, at the same time. 3. A pro sees shots everywhere. Unlike an amateur, who will generally just get one wide-angled shot of every room, a pro will see a creative shot in the turn of a banister, or across a garden feature towards the sunshine. He is trained to look for the shots where they occur, not snap what’s there. 4. A pro will add ambience. He knows when to turn lamps on, and when to rely on the sun coming through the window instead. He is adept at capturing atmosphere like a roaring fire or flickering candle. 5. A pro takes his time. He has allocated a certain amount of time for the shoot, often several hours, and will walk round the property and plan the shoot carefully in his head. He takes account of where the light falls, and its path over the course of the shoot. 6. A pro has professional integrity. He needs to get the very best shots possible of your home – that’s his job. Whereas for an agent, the photography is just part of a very complex, demanding job, a pro photographer can instead dedicate himself to the job of getting those perfect images, no matter what it takes. 7. A pro will deliver an exceptional finished result. It can easily take almost as long to edit a shoot as it does to take the photographs in the first place. In fact my sister, the fab wedding photographer Kathy Ashdown, takes 40 hours to edit a wedding that took her perhaps 12 hours to shoot. White balance, levels, saturation, sharpness, and lots more all have to be accounted for and enhanced so that the finished image is practically a work of art.